Top, centre, a sample of some 'screened' dry-slaked, 1:3 quicklime:sand mortar with, below it in the centre, a fully mixed and matured sample of mortar made from the very same mix, but now to a ratio of 1:2 slaked lime:sand. On either side are four samples of historic mortars from the 17th and 18th centuries for comparison. With the lime revival of the past 25 years (which for many years was primarily based on the use of pure, non-hydraulic lime prepared as a putty mixed with a well-graded aggregate) it is interesting to note that there has been an emphasis on the common use of a 1:3 lime:sand ratio based essentially on a measurement of the 'voids by volume' within a measure of dry sand. It is generally accepted that this measurement provides a good indication of the volume of lime binder required to ensure a coating of lime around every grain of sand, and technically it is quite correct. The important thing to note here is that the lime used in the ratio of 1:3 was not prepared slaked lime (calcium hydroxide) but unslaked quicklime (calcium oxide), a fundamentally different substance in several respects, including volume. This vital point has frequently been overlooked and has led to misinterpretation of a great many historical mortar mixes based on original documents recording mortar ratios, or on those recorded within old craft books. A simple but very good example of this is to be found in an architect's private site book, for an entry dated 1927 on preparing lime mortar as follows: 'Mortar: Lime 1, Sand 3. Lime: slack [slake] with water and then cover with sand. After lime is thoroughly slack, screen through upright screen and then mix with water to desired consistency'. The proportions used by this architect for mixing quicklime with sand would not apply to a mix made with hydrated lime (whether hydraulic or non-hydraulic) because all quicklimes increase in volume when they are slaked. The amount of increase varies according to the type and class of lime but typically this is between 60 and 100 per cent. Therefore the resultant lime:sand ratio for the finished mortar is always more lime-rich than the originally-stated ratio. That is why, under analysis, the majority of historic lime mortars are not commonly found to be 1:3 but typically vary between 1:1½ and 1:2, just as the original mortar makers and craftsmen intended. This is borne out by extensive analysis carried out over many years by The Scottish Lime Centre Trust. (At the last count the organisation has analysed around 4,500 historic mortar samples, approximately 80 per cent of which were from Scotland, 10 per cent from England with the remaining 10 per cent from various other countries.) 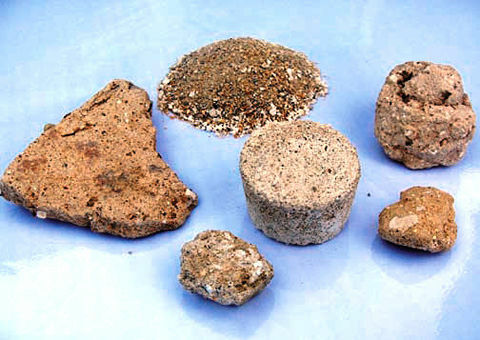 The average lime:sand ratio on the organisation's entire database of historic mortar samples is around 1:1½. The 1:3 quicklime:sand ratio suited most general building sands. However, sometimes builders had to use a naturally fine and more uniform local sand, not the ideal well-graded building sand, but one that demands an increased lime content to make good mortar. Then the craftsmen simply adjusted the quicklime content accordingly. A good example of this was discovered during archaeological works to the external brick fabric of Aspley House, Bedfordshire (late 17th-century and enlarged 1745). The Scottish Lime Centre Trust, on behalf of the writer in his role as historic brickwork consultant, undertook detailed analysis of several samples of original mortar, which is known to have been made using the fine sand obtained from within part of the curtilage of the property, and mixed with the local (Totternhoe) feebly hydraulic grey chalk lime. These mortars had been used for both the mansion brickwork and on a long and very high garden boundary wall to the rear of the property. The main house brickwork mortars, from both phases of construction, were to identical ratios of 1:1.4, but interestingly, the mortar for the garden wall brickwork was to a ratio of 1:0.7, revealing that the bricklayers had simply doubled the ratio of lime to sand as a logical and pragmatic way to gain additional strength and the weathering capabilities deemed necessary for this most exposed of elements. Misconceptions concerning the traditional method of gauging quicklime to sand have contributed to some mortar failures based on a volume ratio of 1:3 with ready-to-use lime, particularly where inexperienced personnel working with lime putty have not realised that a measure of lime within a ratio might not be one full unit of lime. Lime putty contains a sizeable percentage of water; thus reducing the actual binder content within that ratio further. It is essential to discuss with the lime supplier the best method to achieve the specified volume ratio when lime putty is the specified binder. Generally speaking, good mature putty (four months old as opposed to fresh putty) will have a relative bulk density of 1.350kg/m3, will weigh approximately 1.45 kg/litre, and will contain 640-650g (equivalent dry weight) of lime per litre, or 470-480 g/kg. Non-hydraulic and hydraulic limes are both available today as dry hydrates. The former, as 'high-calcium' lime (generally marked 'CL90' to indicate that it contains 90 cent calcium lime), is usually marketed as builder's lime, and is primarily intended as a plasticiser in cement:lime:sand mortars (1:1:4 or 1:1:6 for example) for modern masonry construction. This processed lime is not, however, a good substitute for traditional non-hydraulic lime putty or for use on traditionally constructed buildings as it does not possess the same working characteristics as traditionally slaked non-hydraulic lime putty. It is not intended for lime:sand mortars and cannot be relied on to meet the strength and durability performances required. Modern dry-hydrated hydraulic limes, marketed as 'natural hydraulic limes' (NHL), are classified in three ascending numerical grades of compressive strength at 28 days, expressed in Newtons per millimetre squared, as NHL 2, NHL 3.5 and NHL 5. These grades are broadly equivalent to the old classifications of 'feebly', 'moderately' and 'eminently' hydraulic limes respectively. When gauging natural hydraulic limes with sand to make a mortar it is important to understand that dry hydrates have different relative bulk densities from sand (as do all powder binders) and therefore should ideally be accurately weighed. As weigh-batching is rarely practised on-site, most lime suppliers specify volumes of sand (usually to the nearest 10 litres) per full bag of NHL. It is also important to remember that damp sand increases, or 'bulks', in volume (the amount being dependent on sand grading and moisture content), whereas saturated and bone-dry sand have identical volumes. Allowance must be made for this when measuring the sand, so it can then be accurately volume batched with the lime to the specified ratio. Again it is important to discuss this and agree the correct procedure with the lime supplier. GERARD LYNCH MA PhD, master bricklayer and historic brickwork consultant, trained through the apprenticeship system and at Bedford College where he later became head of trowel trades. With over 35 years' experience as a bricklayer, and following extensive academic research over the last 15 years, he is now an internationally recognised specialist in the pointing of traditional brickwork, with a doctorate on historic brickwork technology and three books on pointing to his name.